The Rebirth of the Clinic begins with a bold assertion: the doctor-patient relationship is sick. Fortunately, as this engrossing book demonstrates, the damage is not irreparable. Today, patients voice their desires to be seen not just as bodies, but as whole people. Though not willing to give up scientific progress and all it has to offer, they sense the need for more. Patients want a form of medicine that can heal them in body and soul. This movement is reflected in medical school curricula, in which courses in spirituality and health care are taught alongside anatomy and physiology. But how can health care workers translate these concepts into practice? How can they strike an appropriate balance, integrating and affirming spirituality without abandoning centuries of science or unwittingly adopting pseudoscience?Physician and philosopher Daniel Sulmasy is uniquely qualified to guide readers through this terrain. At the outset of this accessible, engaging volume, he explores the nature of illness and healing, focusing on health care's rich history as a spiritual practice and on the human dignity of the patient. Combining sound theological reflection with doses of healthy skepticism, he goes on to describe empirical research on the effects of spirituality on health, including scientific studies of the healing power of prayer, emphasizing that there are reasons beyond even promising research data to attend to the souls of patients. 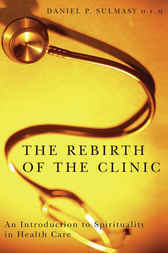 Finally, Sulmasy devotes special attention and compassion to the care of people at the end of life, incorporating the stories of several of his patients.Throughout, the author never strays from the theme that, for physicians, attending to the spiritual needs of patients should not be a moral option, but a moral obligation. This book is an essential resource for scholars and students of medicine and medical ethics and especially medical students and health care professionals.